There have been reports of 3-5" of rain in the New Bedford area already today as Hurricane Arthur races Northeast towards the Canadian Maritime. An additional 3-6+ inches of rain is likely in Bristol and Plymouth counties which will lead to a significant flooding event in that portion of the state. As I type this the NWS has upgraded to Major Flood Emergency in New Bedford. Flash flooding is likely in other areas as the rainfall rates increase. Do not drive through a flooded roadway. The rain ends around midnight west to east. Rest of the weekend is great. We officially have our first Hurricane of the 2014 North Atlantic Hurricane Season. Arthur has been upgraded by the National Hurricane Center as of 5 am. The storm will still track south and east of the Cape, but some heavy rain is expected tomorrow. Tropical Storm force winds are likely on the Outer Cape/Islands. A cold front is slowly moving east towards the coast. The line of thunderstorms died out as it entered Worcester County yesterday. The same areas that saw some severe weather and flash flooding are expected to again today. Heavy rain, gusty winds, and frequent lightning will be the primary hazards but hail and a brief tornado are not impossible back in NY/VT. 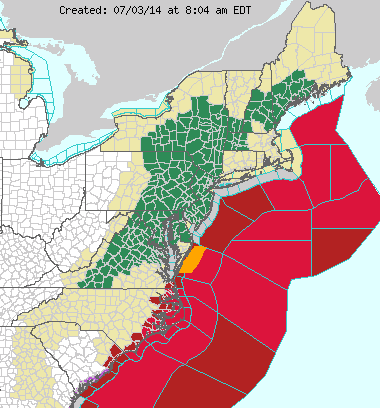 In anticipation of heavy rain there are flash flood watches up for many places in the interior Northeast (in green). 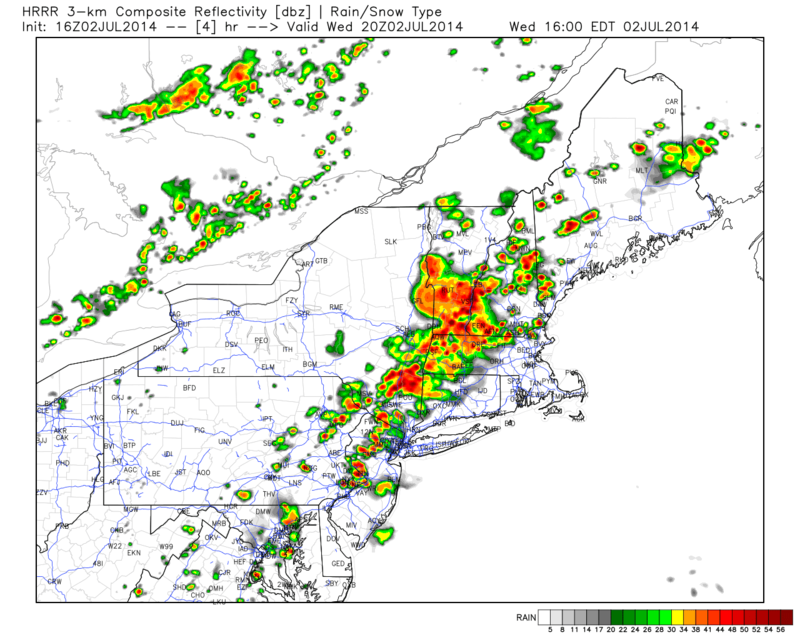 For today there will be rounds of showers/thunderstorms throughout SNE. Some places will stay completely dry, others will be hit multiple times. Keep an eye to the sky. Boston should be ok for the fireworks tonight. Any overnight rain ends early enough that the first half of Friday is dry, albeit muggy. Around early afternoon the rain from Arthur should arrive. Worcester and Boston are looking at ~1.75", with ~2" in Providence, Brockton, ~2.5 in Plymouth, Hyannis. 3"+ likely Outer Cape/Islands. This is not a major storm for New England, in fact many recent Nor'Easters have had a greater impact. However it is distruptive. The good news is after this clears high pressure builds for the rest of the weekend. He may be a Hurricane by the end of the day. 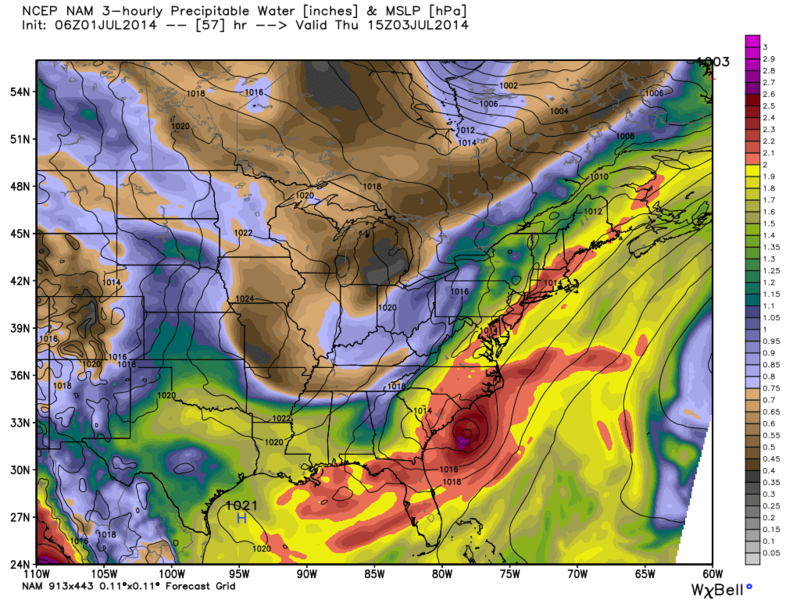 The latest EURO computer model just arrived and is showing significant rainfall in Eastern New England. More tonight/tomorrow morning. Notice the dark colors north of the system. That is dry air that is killing some of the thunderstorm growth in the center of the storm. We do see thunderstorms making a comeback in more recent images. Most guidance shifted slightly west overnight. It still appears rounds of tropical downpours are likely tonight through Friday with a chance for stronger bands later Friday night as Arthur passes. As of now I recommend keeping plans North and West of the Pike. 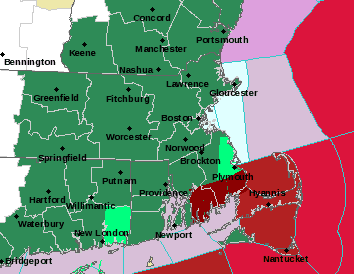 I would be prepared to deal with Tropical Storm conditions in SE MA/RI. A clear picture will emerge today as to where any potential heavy rain sets up. It does appear the heaviest rains will be in the Mid-Atlantic and up through Albany as well as the Cape/Islands. Again tropical systems are difficult for the models to handle. There is a 10-20% chance much of Southern New England sees tropical storm force winds which could bring down some trees/power lines. That's a 80-90% chance it won't happen, but something to keep an eye on. A tropical depression has formed off the Florida coast and is forecast to strengthen into a Tropical Storm/Hurricane by the end of the week. It will impact the 4th of July holiday up and down the East Coast. Overnight Wednesday into Thursday is when Southern New England may get into the severe action. Of greater concern is the potential interaction between the tropical system and this front. The NAM low res has precipitable water amounts of 2"
As of now it appears at least an inch of rain will fall across much of the area in the next 5 days. There will be jackpot areas of much more rain but its tough to tell where these will be right now. Guidance will help today as the storm gets a bit stronger and starts to move slowly northward. It is important to remember that sea surface temperatures are above normal along the east coast. This system is small so strengthening is likely. While unlikely, a more westerly track would have big time implications for coastal Southern New England. Even with a track south and east high waves and rip currents will effect beaches this weekend. With a weak El Nino likely to develop this summer, most of the tropical action will be in close to the United States. One can see the Eastern Gulf and SW-Central Atlantic as prime areas for development this season. More to come.